The unit is tested and works. You will probably have to update the firmware on the unit. The unit will need to be hard reset as well. Slick unit. Good shape with normal wear. Just a heads up if you are new to these. We cannot be held responsible for delays caused by carriers. I want you to be happy with your order. It has been tested successfully. There is moderate wear and tear apparent on this item. Scuffing and scratches are generally present throughout, and can be easily noticed. Will not affect functionality of unit. SONY PYXIS GPS IPS-360 SYSTEM "BUNDLE" FOR LAND/AIR/SEA "1991" IN ORIGINAL CASE! 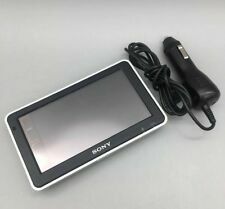 This is a very nice Sony NAV-U personal navigation system (GPS), model NV-U83T complete with the manuals and accessories. The unit is in excellent condition with minimal wear, other than some light scratching. Included are the manuals, software CD, case, cables, and mounting pieces. The unit is in excellent working condition. Good pre-owned condition. TESTED and fully functional. NV-U83T also has Bluetooth hands-free communication. A Nav-U easily mounts within arms reach in virtually any vehicle. The Super Suction Cup makes mounting options endless. Once mounted, snapping a Nav-U onto or off of the cradle is easy with the intuitive locking design. All photos are of our worst conditioned item in a lot. You will likely receive an item of equal or better quality than the actual photos. Overall good condition. This navigation set is used with a few scratches but no major cosmetic damage. It has been tested and is in working condition. Listing is for the screen, car cradle and cables as shown in photos only. Manufacturer: Sony. Electronics Cafe specializes in used electronics. max-width: auto; }. THINK GREEN. Local pickup is always an option. 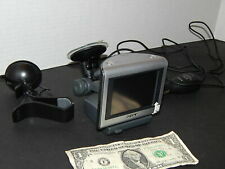 SONY PYXIS GPS IPS-360 SYSTEM "BUNDLE" FOR LAND/AIR/SEA AS IS NOT TESTED! This is sold AS IS. will power on but I can not get it to show any data on screen. I bought this in Estate Sale, not familiar how it works so is being sold as is. """. "NOT TESTED"""""! Playstation Portable. To ASIA will be cheaper and. Accessory Type.